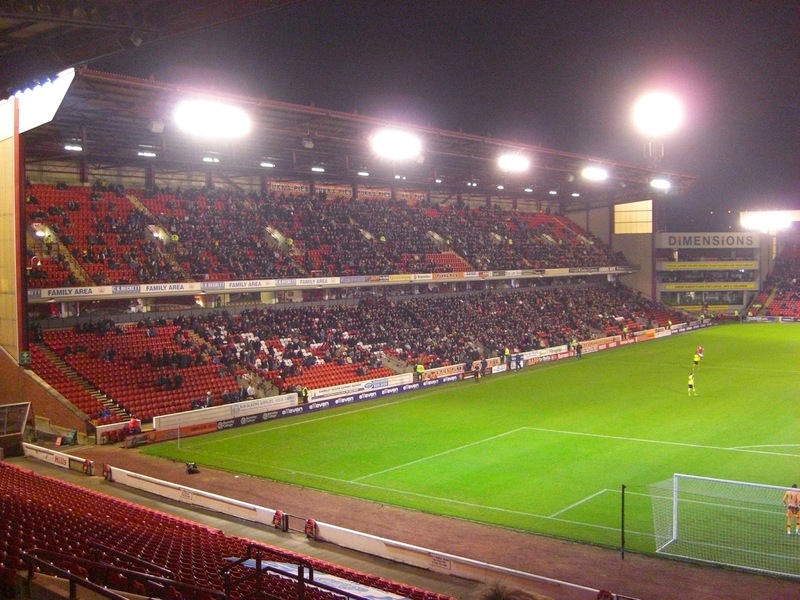 My twenty-third stadium of 2014 was on Friday 14th November at Oakwell in Barnsley, South Yorkshire. The match was Barnsley vs. Colchester United in Football League One. Oakwell is in the east of the town around half a mile from Barnsley railway station and the town centre itself. The venue was opened in 1887 and the club have played there ever since. 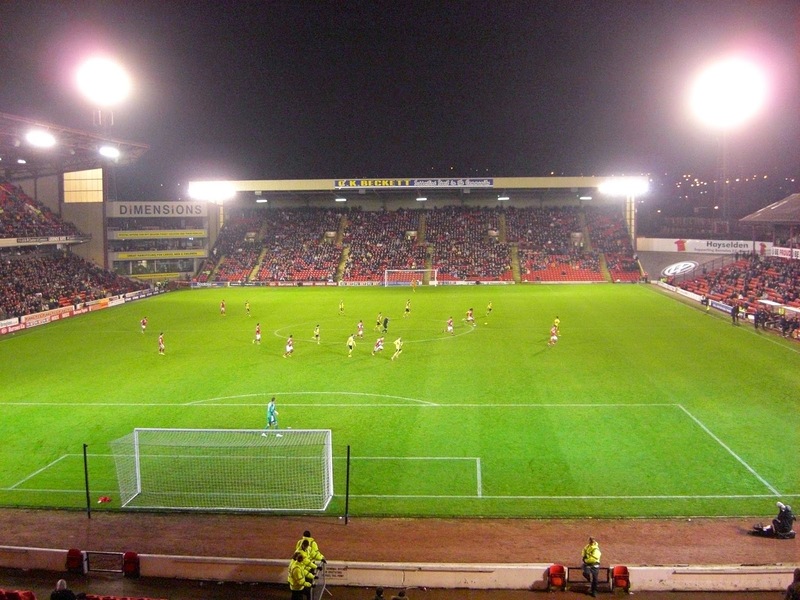 Oakwell was extensively renovated during the 1990s and the West Stand is the only original part of the ground still in use. The West Stand is a two-tier structure which is partially covered and is a throwback to another era when compared to the rest of the stadium. The upper section has a roof with a number of supporting columns so there are restricted views for anyone in this part of the stand. Some of the seats remain from when it was built in the early part of the 20th century. The lower tier of the stand is uncovered and contains modern seating throughout. The capacity of the West Stand is around 4,750. On the opposite side of the pitch is the East Stand, which, with a capacity of 7,500, is the largest in the ground. There are two tiers of seating with executive boxes splitting the two tiers. In the corner between this and the Pontefract Road End is an additional section for corporate viewing with room for just over 200. The Pontefract Road End itself is a single-tier stand able to house 4,500 fans and also contains the reception, club shop and a gym. The North Stand is a large single tier stand with room for over 6,000 spectators. This is used as the away end though with Barnsley currently in the 3rd tier it is usually mostly empty. Directly behind this stand are several football pitches which form part of the club's academy set-up. Colchester made a bad start and were 1-0 down after just 3 minutes - the ball broke to Sam Winnell in the corner of the penalty area and he drilled a shot into the bottom corner of the net to give the hosts the lead. The U's were looking shaky and almost conceded a second shortly after. In the 15th minute the equaliser came as Elliot Hewitt's low cross evaded several players before Sanchez Watt poked the ball home. The game ebbed and flowed as both sides had chances with Barnsley having a goal ruled out for offside. Colchester again made a slow start to the second half and in the 55th minute retook the lead. As Devante Cole advanced on goal Sean Clohessy mistimed his tackle resulting in a penalty. Conor Hourihane sent Sam Walker the wrong way from the spot to put Barnsley 2-1. The Reds then extended their lead in the 70th minute when Peter Ramage leapt highest to head in a corner. The visitors did not give up and in the 75th minute brought the game back to 3-2 when Rhys Healey played an excellent ball through for Freddie Sears who smashed past Ross Turnbull in the Barnsley goal. Colchester applied the pressure late on but were unable to make it count as Barnsley won an exciting game of football.